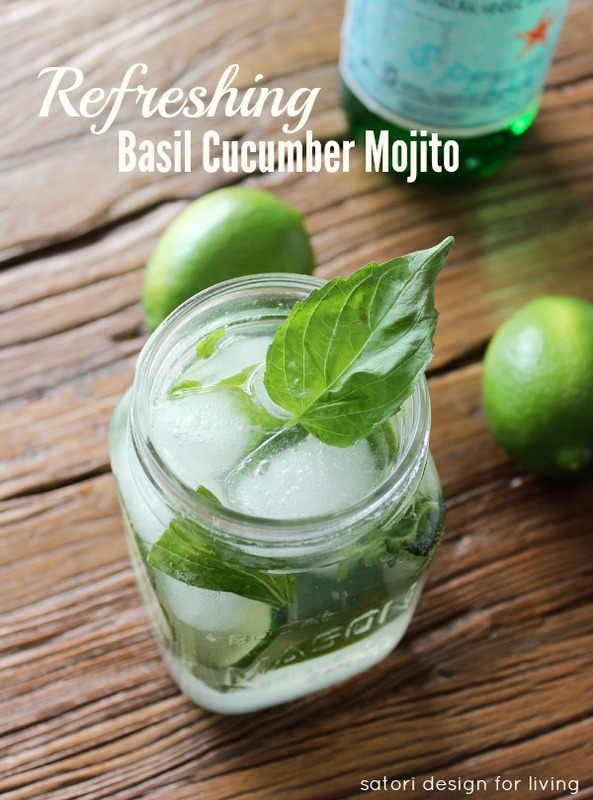 Looking for thirst-quenching summer drink ideas? 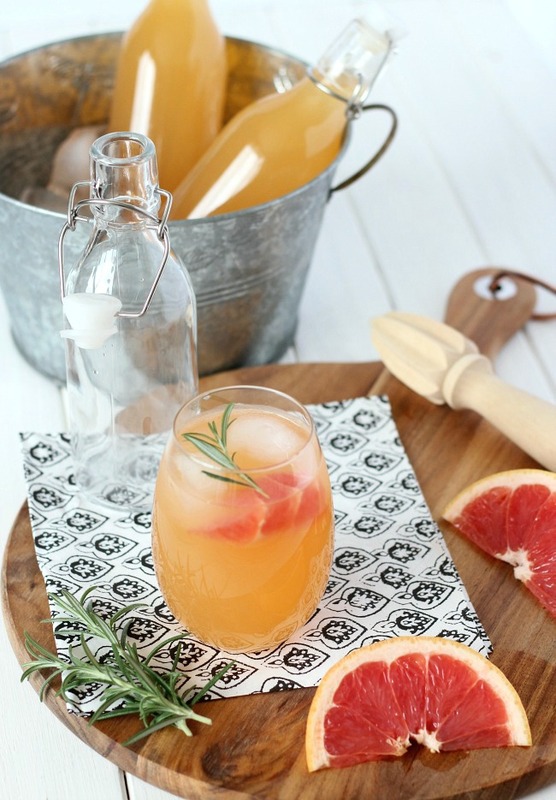 Try this freshly squeezed, rosemary infused grapefruit spritzer recipe that is packed with flavour! Hello everyone! 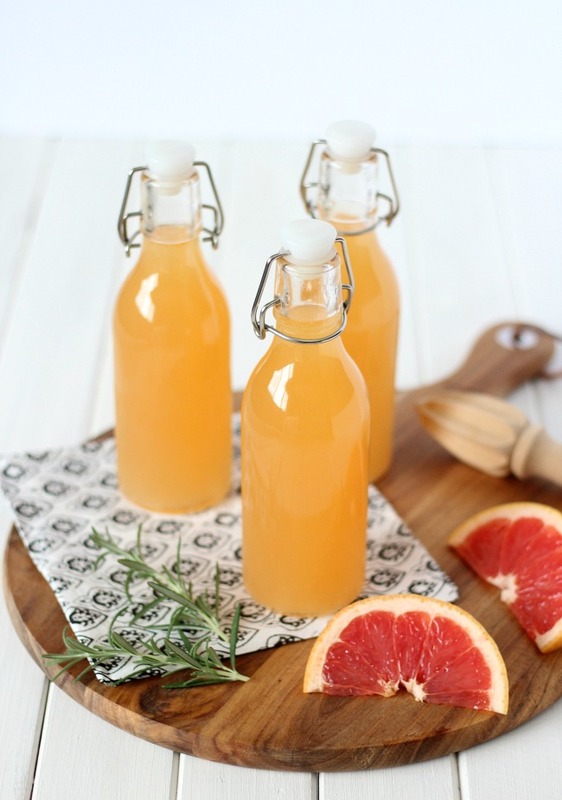 I’m still on my summer break, but thought I’d pop in today and share a delicious grapefruit spritzer recipe with you. We’ve been experiencing an unusually hot July, so refreshing and thirst-quenching drinks are definitely a necessity! 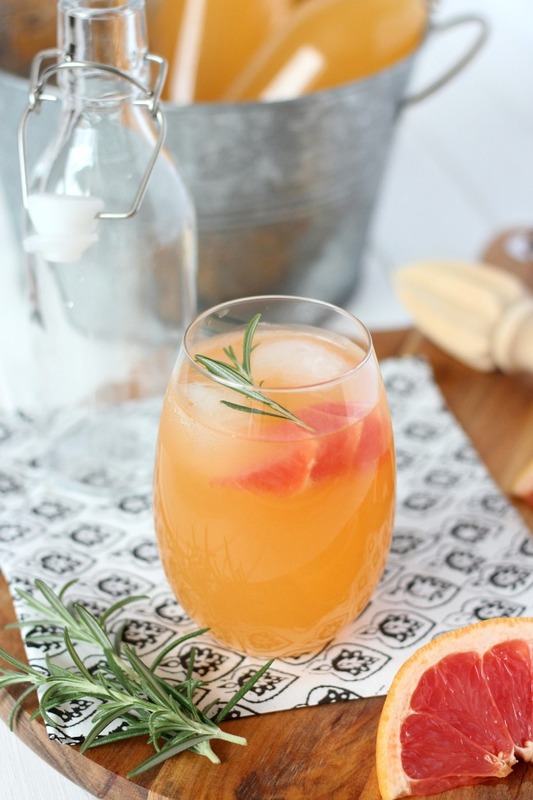 If you enjoy the sweet and tangy taste of freshly squeezed citrus juice cut with the subtle earthy flavour of rosemary, this cocktail is for you. I wouldn’t go as far as to say it’s the holy grail of summer drinks, but its health benefits and thirst quenching abilities seem to keep me going back for more! Over the summer, we like to spend as much time outdoors as possible. If you’re Canadian like me, then you likely take advantage of the warm months too. They fly by too fast, don’t they? During the week, we tend to stay put in our backyard working on projects or simply kicking back after a long day of work. On the weekends, we enjoy hikes and picnics by the river or in the mountains (yes, we’re fortunate enough to live close enough by for a day trip). Whatever we’re up to, ready-to-go refreshing drinks are a necessity. Sure, you can pick up pre-made spritzers or coolers at the store. But why not make your own where you control the ingredients? Plus, you’ll save yourself a bunch so you can splurge on other goodies to put in your basket like chocolate and cheese! This recipe can easily be modified to suit your preferences- no alcohol, more alcohol, less sweetness, more… You get the picture. They’re also handy when made ahead for a summer party! Whip up a bunch in the morning, store them in the fridge, then transfer to a bucket of ice just before your guests arrive. 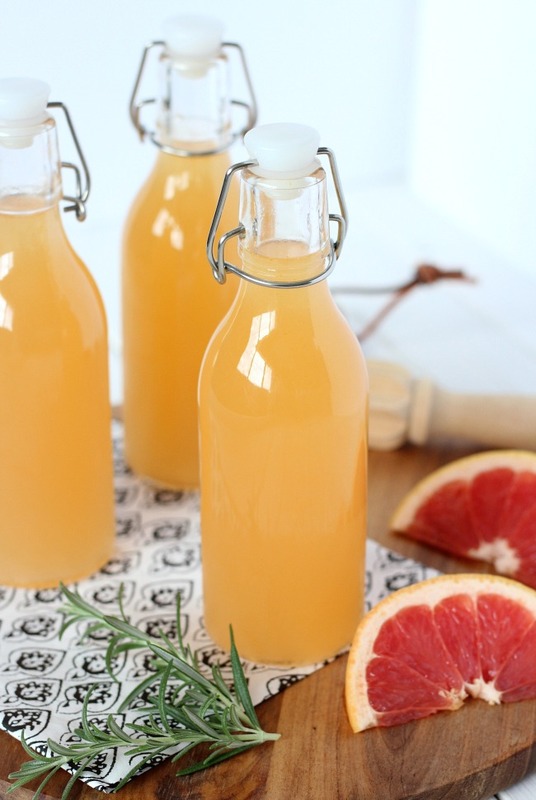 You can even make a grapefruit spritzer label if you want to get all fancy. I found these cute little bottles at IKEA, but I’ve also seen them at dollar stores. A mason jar with a lid works perfectly, too, so don’t fret if you can’t find any. Just make sure your container has a lid to keep the drink sparkling! I like my grapefruit sparkler served in a glass with some ice and a bit of garnish. Looks pretty that way, doesn’t it? Straight from the bottle is good too. Especially on those hot summer days when you need something stat. Guzzle away! 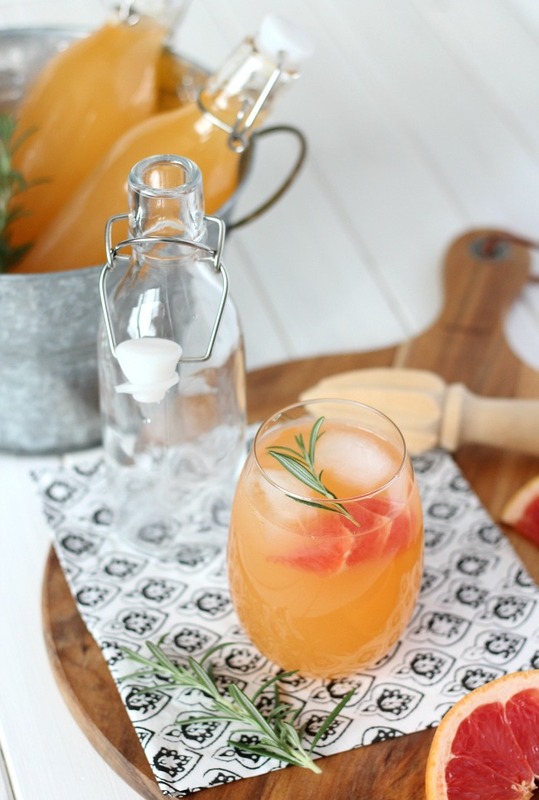 The sweet and tangy taste of freshly squeezed citrus juice cut with a subtle earthy flavour of rosemary! Place water, sugar and honey in a saucepan over medium-low heat. Meanwhile, juice lemon and set aside the juice. Cut leftover lemon into quarters and add to saucepan (with sugar mixture). Bring to a boil, stirring occasionally. Add rosemary. Turn down temperature to low and simmer until mixture becomes syrupy (about 10 minutes), stirring occasionally. Remove from heat and allow to cool. Juice Grapefruits. Add lemon juice to the grapefruit juice and pour entire mixture through a sieve. Once syrup is cool, pour through a sieve into juice mixture. Stir to combine. Add 1-2 ounces of vodka or white rum to bottle (10-12 ounce size). Pour in 5-6 ounces of juice mixture. Top with soda or sparkling water. Seal. Chill before serving. Add ice cubes to glass along with 1-2 ounces of vodka or white rum. Pour in 5-6 ounces of juice mixture. Top with soda or sparkling water. Garnish with grapefruit segment and tiny sprig of rosemary. Use your favourite variety of grapefruit. I used a mix of pink and red for color. You may have to adjust the sugar/honey level depending on how tart the juice is. This Grapefruit Cocktail Recipe was developed for Kim’s Celebrate Summer Series on Today’s Creative Life. 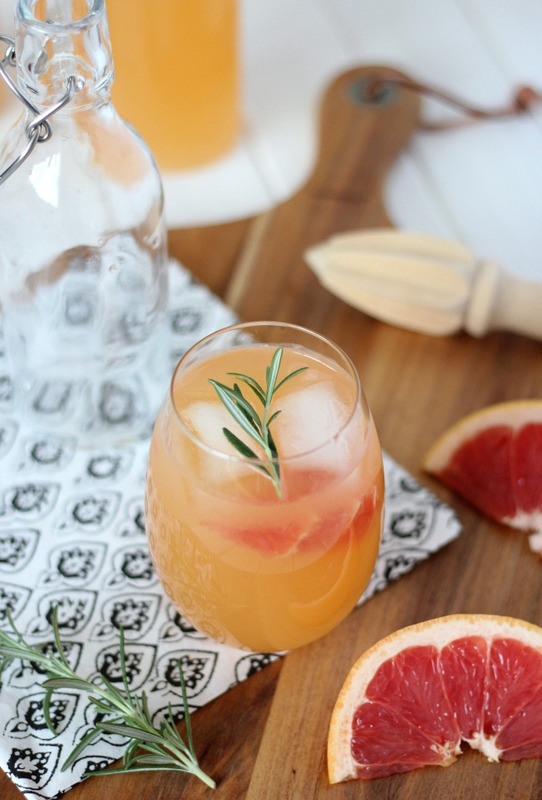 Ever tried a rosemary-infused, freshly squeezed grapefruit spritzer? If not, you definitely need to give this one a try. Your taste buds will thank you! Missing me? Come see what I’ve been up to on Instagram. I’m off to Haven Conference this week in Atlanta, so follow along for some updates! « New Front Door Paint Color or Leave it?